It's time for a little weekend housekeeping, following up on a few earlier posts. In an earlier post I mentioned that the Costa Mesa Parks and Recreation Commission would hear a proposal from a couple groups of Civil War "re-enacters" to provide a weekend-long event at Fairview Park the first weekend of April. At the time I thought that weekend might be pushing the envelope. It turns out I was correct. During the presentation it was determined that the short time between now and the beginning of April didn't give adequate time for all the necessary permits, etc. So, this extravaganza has been pushed out to October of this year. Actually, considering the proximity to the elections in November, that might be a perfect time for this event. The way recent election campaigns have gone in this city, it might be looking a lot like Civil War in our town by that time. 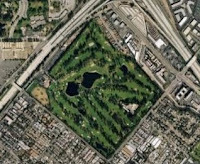 Regarding the probable annexation by Newport Beach of the Santa Ana Country Club and nearby neighborhoods - all of which currently reside in Costa Mesa's sphere of influence - things have taken a new twist. Orange County Board of Supervisors Chairman John Moorlach - a Costa Mesa resident - has decided to stall the proceedings by not putting forward the tax plans essential to this process. So, after the shouts of glee by the members of the country club, their neighbors and most residents of Newport Beach and the wailing and gnashing of teeth by Costa Mesa officials, we're back to square one. That means all that rancor that was created by this issue between our two cities went for naught. 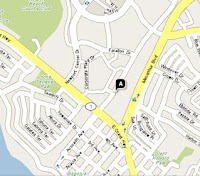 The residents and country club are stuck in no-man's-land and remain islands of country territory. The animosity between our two city councils has intensified, as witnessed by recent public pronouncements of some elected officials, and we still have a truck-load of common-interest projects ahead of us. And, of course, this scab will be ripped off again if and when the annexation issue is re-visited. That self-same person, John Moorlach, then told the assembled masses at the Airport Working Group annual meeting that they needed a better public relations effort regarding the possible (probable) expansion of John Wayne Airport. That cavalier assessment of their efforts certainly rankled attendees, but he might be right. 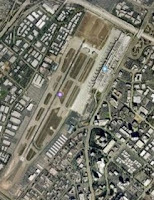 Negotiations for an extension of the current caps on the airport cannot even begin until 2011. I'm sure most of the hard-working attendees at the meeting hoped Moorlach would stand up and say he was going to fight, tooth and nail, to prohibit any further expansion of the airport. He didn't do that. You can read Joe Bell's column on the subject HERE. HOLD YOUR NOSE AND "GO LOCAL"
So, those of us currently being adversely affected by the present traffic load need to take the lead and ramp up the rhetoric and help find alternatives to the expansion of John Wayne Airport. We need to find alternatives to the current scheme - something called "Go Local" - that would attempt to entice us to climb aboard crowded, smelly buses to airports in the hinterlands - San Bernardino and Ontario - instead of boarding flights at John Wayne for our exotic destinations. 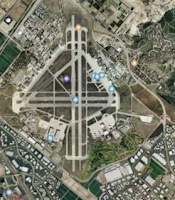 One alternative, the creation of a regional international airport at Camp Pendleton, has been espoused by myself and another local blog writer for a couple years. As distasteful as it is for me to agree with anything that guy says, he's got it right this time. It makes a lot of sense, since it could resolve traffic volume problems not only for John Wayne Airport, but San Diego's Lindbergh Field, too. So far, that proposal has gotten nowhere. And, of course, the great frustration in all this is that there sits El Toro, runways still 98% intact, just waiting to be converted into an International Airport! Rumors of the financial difficulties and potential demise of the successful bidder, Lennar, only add to that frustration. And, the ongoing allegations of corruption swirling around the whole Great Fiasco, er, Park further add to it. Maybe we can make a deal with the Emperor Agran. Maybe we can agree to name the new airport at El Toro for him. Do you think that might assuage his ego enough that he will throw in the towel and support the best use of that chunk of Orange County? Nah, neither do I. We bid a fond adieu to our fellow blogger, Not Foolya. His two sites, Goat Hill Harper and Bizarro Tolip have been interesting reads. He tells me that "Fortune has it that me and mine are to exit Costa Mesa". I wish him well, where ever he lands, and hope he will find the time to read about the events swirling around his old digs and comment when he feels so moved. Our old nemesis, the blogger who calls himself Mr. U. Know-Who, has responded to the recent decision by the Newport Beach City Council to move forward with the annexation of the Santa Ana Country Club and nearby neighborhoods, HERE. Following his comments bemoaning the loss of "upwardly mobile citizens", he goes on to create a laundry list of things he feels the current council have not been aggressive enough in pursuing. It's important that we pay attention to this guy because the council majority does. Like a much-less-rhythmic Barry Manilow, he writes the songs for them to sing. He scripts their actions and uses the threat of non-support - as he did by taking credit for getting perpetually inept Chris Steel un-elected a few years ago - as a billy club with which he bats them around when he's ticked off at them. "1 - Work much harder to put homes on our view bluffs to attract upwardly mobile people back to Costa Mesa. If surgical eminent domain is needed, so be it. Get the job done!" Did you get that phrase, "surgical eminent domain"? You will recall that I've consistently warned you about this from the very beginning, when the so-called "improvers" began to flex their muscles after Eric Bever took his seat on the dais. If Mr. U. Know-Who is writing the words you can darn bet that it won't be long until one or more of the majority on the council will echo it. Every member of the council has consistently said they are against eminent domain... we'll see. This character has in the past called for bulldozing what he refers to as, "barracks-style apartments", which he thinks are havens for gangsters and other miscreants. He's not fooling anyone - he means those Latinos in our midst. "7. Stop listening to the anti-American haters, brown racists and assorted dimwits with small brains and big mouths and start listening to citizens who want Costa Mesa to be a first class American city, not a Third World slum." It's clear to me that this guy means anyone who doesn't agree with his white supremacist rants and his plans for the expulsion of all brown skins from our city. I suppose he's including me as one of those "assorted dimwits with small brains and big mouths", which is just fine with me. I view things in this city very differently than he does. I view it through the prism of what is best for all residents, business owners and stakeholders in this city. It's clear from his actions and public pronouncements that his goal is to satisfy only the wishes of a very small minority. Many of those who follow his mantra obviously share his intolerance for anyone who is not white. "Race is not evil. It is to humans what breed is to dogs. It is nature's way. It is a step along the path to differentiation from others and to eventual speciesh ood. Blending back in by mixing unlike chromosomes is a folding of humans back into the undifferentiated mass. This is just the opposite of evolution. Evolution is a distillation from out of the mass. It always has been that way and it always will be that way. Humans need to face that fact and use it to their advantage. And to do this, they must not deny race and genes and human differences or try to overcome them to become Tan Everymen. They must seek to be unblended so that evolution can work and they must seek those qualities and characteristics in mates that will move them forward, via their children, on the path that goes to ever higher consciousness." If that sounds vaguely familiar, just harken back to Germany in the late 1930s when a funny looking little guy with a tiny little mustache and a big mouth began preaching exactly the same thing - the purity of the Aryan race. Is this really the philosophy you want guiding our city? Most people I know who pay attention to things in this city acknowledge that Mr. U. Know-Who is a smart guy - maybe the smartest guy in the room at any one time. With absolutely no sign of humility, he waves his alleged Mensa membership around like a battle flag. However, being smart doesn't necessarily mean he's right. As I've said in the past many times, his prodigious intellect is wasted on his vile, vicious racist rants that are published on the internet for the world to see. Never has this been more true than his most recent anti-Barack Obama publications on his blog and other sites. I'm not an Obama supporter, but Mr. U. Know-Who's comments about him are incendiary, to say the least. You may take a deep breath, hold your nose and read two recent essays HERE and HERE. As we move forward in this next election cycle I'm sure he will, as has been his practice in past elections, strongly express his views about candidates. Since he's been berating the current majority and, based on several years of written and verbal comments, appears to hate Katrina Foley's innards, it will be very interesting to see which candidates he will be supporting - who he thinks he can manipulate once in office. Through the smoke screen Mr. U. Know-Who throws up about "making Costa Mesa a nicer place to live", remember what that means to him. It doesn't mean simply fixing potholes, which he has brushed aside as meaningless. The litany of things he has espoused to "make Costa Mesa better" - whether it's closing the Job Center, displacing the Westside charities, dislodging the industrial business on the Westside, to be replaced by upscale homes, the disbanding of the Human Relations Committee or his attempt to shut down the Orange Coast College Swap Meet - all have a common thread. That thread is the discomfort and dislocation of the Latino population in our city. Do I believe every person who is moved by his rhetoric is necessarily a racist? Of course not! I do firmly believe, though, that there are more than a few folks in this town who follow his drumbeat of intolerance but ignore his real goal because they are uncomfortable with the changing demographic in our city. Many of those jumped on the Allan Mansoor/Wendy Leece anti-immigrant band wagon in 2006 because they apparently believed what they were being told - that the Latinos among us as the root of all evil in our city. The flames of that intolerance were fanned furiously by Mr. U. Know-Who and his small cadre of sycophants. The big news in the Newport-Mesa area last night came out of the Newport Beach City Council meeting. As reported by Briana Bailey in the Daily Pilot, HERE, the council voted unanimously to support the will of the people and move forward to build the new City Hall on that 12+ acre parcel adjacent to the Main Library. Despite all the wailing and gnashing of teeth by the shrub-huggers, this was a good decision - one that made sense from so many standpoints that it was hard to see how any reasonable person could have opposed it. However, as we have seen over the past couple years, passion and reason are not usually found snuggled up together. The only remaining clinker in this scenario is activist Allan Beek's lawsuit. Hopefully, the well-intentioned Beek will see the light and drop the suit and save the city from having to spend some much-needed money on it. We'll see. All was not goodness and light, though. Bailey reports that the council, with a 6-1 vote, chose to ignore the recommendation of their City Manager, Homer Bludau, and decided to move forward with the annexation of the Santa Ana Country Club and some adjacent residential areas. 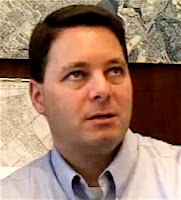 By ignoring Bludau's advice, made quite clear in the last few days in an article by Bailey, HERE, the Newport Beach City Council effectively thumbed their collective noses at the Costa Mesa City Council at a time when it has appeared that there had been progress made in the relationship between the two bodies recently. I fear this new harmony has been blown out of the water. My pal, Byron de Arakal , in his column that appears on the pages of the Daily Pilot this morning, HERE, was assuming too much when he projected a wiser vote in Newport last night. You can't really blame him, though. Bludau's recommendation was the right way to go. The council simply ignored it. The title applied to Byron's column by the editors, "Annexation to worsen Newport-Mesa rift", got it right. Even though Byron's assumption of the outcome was wrong, he nails the reasons why there must be harmony between the leaders of our two cities. There are just too many regional issues - Banning Ranch, John Wayne Airport Expansion, the 55 Freeway extension - that will require close cooperation between our two cities if there is to be any progress made on them. Having watched the Costa Mesa City Council majority in action for some time, I wouldn't be surprised if they chose to look for some way to get even with their counterparts in Newport Beach. That, of course, would be small-minded and petty - but not entirely unexpected of them. It's time for them to shake off this loss and get focused on the other battles to be fought on our behalf. I know it's almost too much to ask, but I'm looking for some glimmer of statesmanship - the maturity to move forward on important issues. In a campaign year, when our mayor is running for re-election and the "improvers" look to solidify their stranglehold on our city government, that seems like an unrealistic hope. We'll see. And then, in an unfortunate bit of timing, the Daily Pilot published a commentary by former columnist Humberto Caspa, HERE, that is guaranteed to pour salt in the wounds opened by the Newport Beach City Council's annexation vote. Caspa, long a critic of the current majority, and Allan Mansoor in particular, attempts to outline the path to power taken by Mansoor on his way to becoming an international media star who made our city a metaphor for anti-Latino actions. Yep, I can see a rebuttal being pounded out by Mansoor any time now. Naghavi Promoted and Civil War Coming? Amidst all the political rhetoric smothering us via the national media these days, and stories about Barack Obama dressing as Osama bin Ladin and Hillary wearing her bumblebee suit, some interesting things are happening in our neck of the woods that require comment. First, the City of Costa Mesa announced the appointment of Transportation Manager, Peter Naghavi, as the new Public Services Director. This is good news for the city. Naghavi has served this city with distinction for 18 years and has proven to be a skilled, hard-working, dedicated professional. The city will benefit from his selection for this new assignment. We extend our congratulations to Peter Naghavi. CIVIL WAR TO COSTA MESA? The Costa Mesa Parks and Recreation Commission meeting, at their meeting on Wednesday should be interesting. Two groups, the American Civil War Society and Marching Thru History Exposition, have asked to be permitted to conduct a Civil War re-enactment event at Fairview Park the first weekend of April this year. Apparently, this will involve battle re-enactments, firing of cannon and display of Civil War memorabilia. I find it ironic that such an event would be proposed for Costa Mesa. I mean, considering the way things have been going in this city for the past couple years we've had our own little "civil war". I find myself thinking that, considering the state of our relationship with the Latino community within our city, that it might be more appropriate to re-enact the Battle of the Alamo.